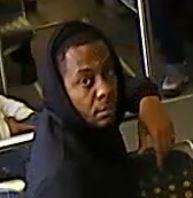 The Los Angeles County Sheriff’s Department, Transit Services Bureau (TSB) Detectives, are looking to identify a man who intentionally exposed himself in a sexually explicit manner in front of a female passenger while riding on the Metro Green Line, in the City of Lynwood, on December 10, 2018, at approx. 10:45 AM. The suspect, who can be seen on train video, appears to have boarded at the Long Beach Metro Green Line Station. The victim stated that the suspect sat down across from her in the same train car. Train video shows that the suspect began exposing himself and attempting to get the victim’s attention. The suspect was engaged in the lewd act for many minutes when the victim finally did notice him. She stated that she was extremely offended and got up from her seat and moved to another part of the train car. The suspect can be seen making note of where the train car cameras were. He then can be seen exiting the train at the Aviation Station. The suspect is described as a Male Black, approx. 25 to 30 years old, five feet, eight inches tall, one hundred eighty pounds, short black hair, a mustache and scruffy beard, he was wearing a black hoodie, blue jeans, and was carrying a black or dark grey backpack with a small, white, logo. LASD TSB handling Detective Karen Velasquez is concerned that the pattern of behavior by the suspect suggests that not only has he done this before, but could also do it again. “People like this should not be on the streets or on our transit system. We want to ensure that we get him identified as soon as possible.” Although the crime that the suspect is currently wanted for is a misdemeanor, his prior arrest history could make this a felony charge. LASD Detective Sergeant Ed O’Neil believes that the suspect will be identified quickly and knows that these types of crimes are indeed rare on the Metro system. Always remember, if you see this person do not approach him! To receive detailed, up-to-date information directly from the LASD via e-mail, register for "Nixle" alerts at www.Nixle.com and register for "LASD-Transit Services Bureau, Los Angeles County Sheriff" and also register for your local LASD station area. Or, text “LASD Transit HQ” to 888777 to receive text alerts only. Standard text messaging rates may apply, depending on your calling plan.